Please be sure to check the Calendar page to find out what’s happening currently with the Doc Fritchey Chapter and the activities we’re engaged in. Also, check the Documents page for our Hatches quarterly newsletters and see our News Archive_2013, News Archive_2014, News Archive_2015, News Archive 2016 and News Archive_2017 pages for information about previous years’ activities. Matt Shenk did his usual fine job as auctioneer, working the crowd to get the best value for the 12 live auction items. We had a record offering of 13 guided and hosted fishing trips this year, with Dave Rothrock’s guided trip bringing in a record amount for our Door Prize Raffle. Russ Collins was selected to receive the 2019 Gerald L. Miller Outstanding Volunteer Award, and our ceremonial “Net” was passed on to Dennis Coffman by Rich DiStanislao after telling the crowd about his past year’s travels with the net, including a trip to Ireland. All in all, it turned out to be a record year for both attendance and net income. We thank those volunteers who served on our Banquet Committee, as well as our sponsors and donors, and especially those who attended our banquet. Click here to see a few pics of the evening’s festivities. 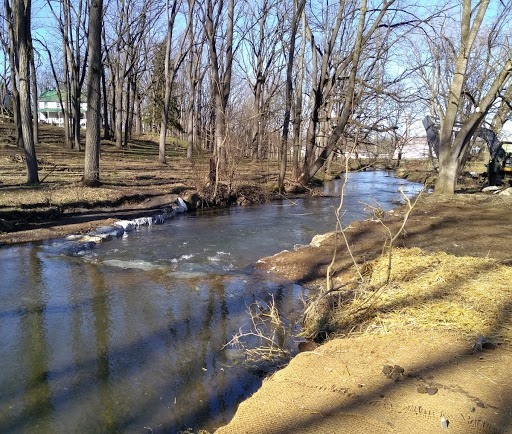 The project, designed by Rocky Powell of Clear Creeks Consulting and constructed by Aquatic Resource Restoration Company, was funded in large part through a grant provided by the PA Fish & Boat Commission. The project consisted of reconstructing and stabilizing streambanks, narrowing the stream channel and redirecting the streamflow to reduce sedimentation, and building a number of much-needed habitat structures. Installation of new livestock fencing and streambank planting will take place in early spring. Since 2014, this award has been presented annually to a chapter member whose volunteer work has consistently and substantially contributed to the attainment of the chapter’s mission to “conserve, protect, and restore the coldwater fishery resources of Dauphin and Lebanon counties” through education or hands-on involvement with chapter projects. This award honors the tireless conservation work performed by the late Gerald R. (Gerry) Miller who passed away in 2013 after serving both the chapter and PA State Council in a variety of roles since becoming a TU member in 1999. The 2019 Gerald L. Miller Outstanding Volunteer Award will be presented at the chapter’s Annual Banquet on March 23. Click here for a nomination form which can either be scanned and sent by email to chucks@dftu.org or mailed to Chuck Swanderski, 50 Manor Circle, Palmyra, PA 17078. All nominations must be submitted no later than February 26. Hammer Creek, which originates in eastern Lebanon County and flows 19.2 miles through Lancaster County where it joins Cocalico Creek, is a stocked trout stream below Speedwell Forge Dam, but also harbors a wild brook trout population in its upper headwaters. Chapter member Jim Suleski has taken on the task of organizing a plan to work with landowners to educate them on the merits of restoring badly-eroded streambanks in these upper reaches and obtain their approval s to facilitate a stream improvement project. The plan is moving forward through the cooperative efforts of the Donegal Chapter of TU, National TU, Lebanon County & Lancaster County Conservation Districts, Upper Hammer Creek Watershed Association, Alliance for the Chesapeake Bay and the Chesapeake Conservancy. A breakfast meeting with the landowners and all stakeholders is scheduled for February 28 at the Middle Creek Wildlife Refuge. For more information and to volunteer to assist in this effort, please contact Jim Suleski at jims@dftu.org. The Cumberland Valley Chapter of Trout Unlimited will be holding the 25th annual Rivers Conservation and Fly Fishing Youth Camp from June 16-21, 2019. The camp will again be held at Messiah College in Grantham, PA. Admission will be limited to 32 selected qualified students, ages 14 to 17. The applicants must have been born between June 21, 2001, and June 16, 2005. The 32 students will be selected through an application process where they must state why they want to attend camp and obtain a support letter from a school science teacher or guidance counselor. A student doesn’t have to be an accomplished fly fisher or a budding aquatic biologist to attend. The student only needs to be highly motivated and willing to learn. The camp tuition is $550 per student which includes all meals and accommodations. Doc Fritchey TU will pick up the cost for two students from either Dauphin or Lebanon County. Applications must be received no later than March 31, 2019. For more information, a camp brochure, or to apply, visit the camp website at www.riverscamp.com . Be sure to watch the camp video there. Questions may be submitted at the website or via email to riverscamp@gmail.com . 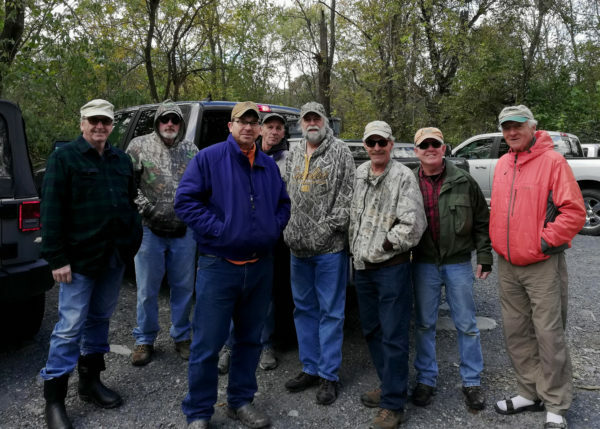 9 chapter volunteers showed up to meet the PFBC stocking truck on October 24 and float stock the DHALO special regulations section of Quittapahilla Creek in Annville. Starting at the Spruce Street bridge and the parking lot in Quittie Nature Park, two teams of volunteers distributed about a dozen buckets of trout throughout the length of the DHALO stretch down to the bridge on SR934. While these waters were stocked earlier this year with extra large trout under PFBC’s Keystone Select program, this fall stocking consisted of mainly smaller to medium size trout. Click here to see more pics of the stocking. 14 chapter volunteers turned out to repair the damages created by the heavy rains and flooding at the diversion well site during the past few months. The crew was able to make repairs to the diversion dam as well as cleaning out the square well to get it back into operation. For pictures of our workday, click here. Jim Suleski, who has just been appointed Director of Communications for our chapter, arranged for a TV interview on September 14 with WHTM (Channel 27) to talk about the conservation work that DFTU is currently involved with. Joining him in Lebanon to talk about our upcoming project on lower Snitz Creek was President Russ Collins. Best Chapter Project award. 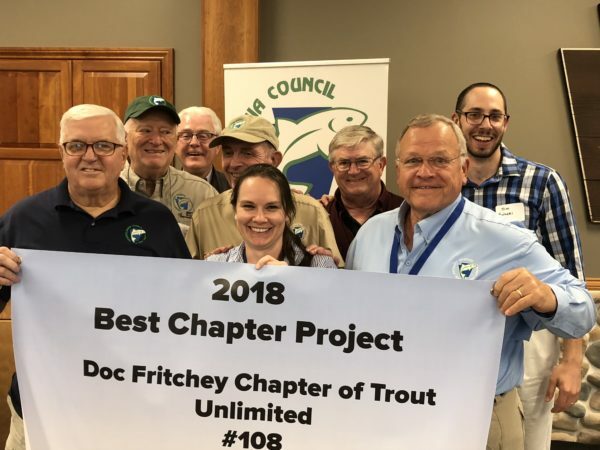 Vying for this award with 48 other chapters across the state, our Snitz Creek stream restoration project handily won out over the competition. The project which will restore streambanks and improve habitat for approx. 1200 feet of stream corridor in lower Snitz Creek was originally slated to start in June, but is now anticipated to begin in October as a result of the extreme rainfall and high flows experienced this summer. To find out more about this project, click on the drop-down box on the Projects page. This is the third time that our chapter has garnered PATU’s Best Chapter Project honors. In 2005, we won for our work on Harrisburg’s Spring Creek, and again in 2014 for our long term work on the Rausch Creek diversion wells. The following slate of officers and directors has been nominated to serve for FY2019 which begins October 1, 2018. Elections will be held at the chapter’s annual meeting on September 25. Other nominations will also be accepted from the floor. Several revisions are also proposed to bring our Bylaws in line with the chapter’s current operating procedures….see attached. 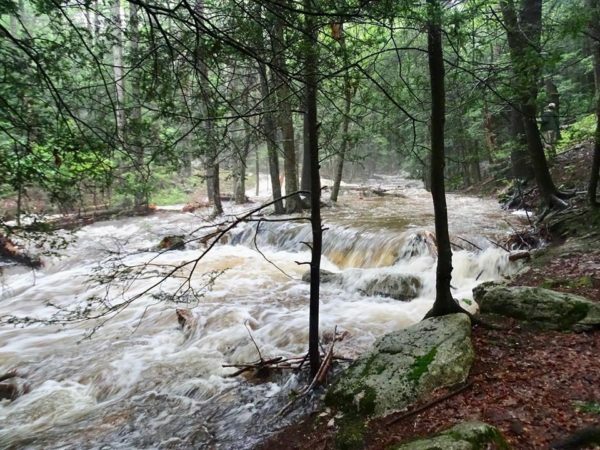 The record rainfall in south central PA during the month of July appears to have abated, at least for the time being, and smaller streams should now be starting to drop back to more seasonal flows. The Rausch Creek diversion well crew which visits the well site for maintenance every Monday evening was greeted with the following sight on July 23 after more than 7” of rain was recorded over a 2-day period. This follows on the heels of heavy rains earlier in the month which required the crew to remove much debris that had been washed into the wells by the high water. On April 17, the PA DEP announced the creation of a new grant program funded by the $12.6 million penalty imposed on Sunoco Logistics related to construction of the Mariner East 2 pipeline. Grants will be awarded for projects that reduce or minimize pollution and protect clean water in the 85 municipalities along the length of the pipeline corridor. The Sunoco Penalty Grant opportunity generated nine proposals submitted by five non-profit entities to improve the water quality in the Quittapahilla watershed. Three proposals were submitted by the Quittapahilla Watershed Association in partnership with The Lebanon Valley Conservancy (TLVC), with the crucial help of Doc Fritchey TU. For a complete list of the proposed projects, click here. A gloomy, rainy day greeted the 14 women who showed up at Ed & Nichole O’Gorman’s property for an introduction to the basics of fly fishing, hosted by our chapter. Membership Chair Chuck Swanderski who organized this event led off with introductions, followed by breakout sessions to learn the various elements of fly fishing. After the rain finally stopped in mid-afternoon, chapter volunteers were on hand to guide those women who were interested in utilizing their newly acquired skills on the stream. All in all, it was felt by all who participated to be a very productive, fun day. Click here to see some pics of the event. 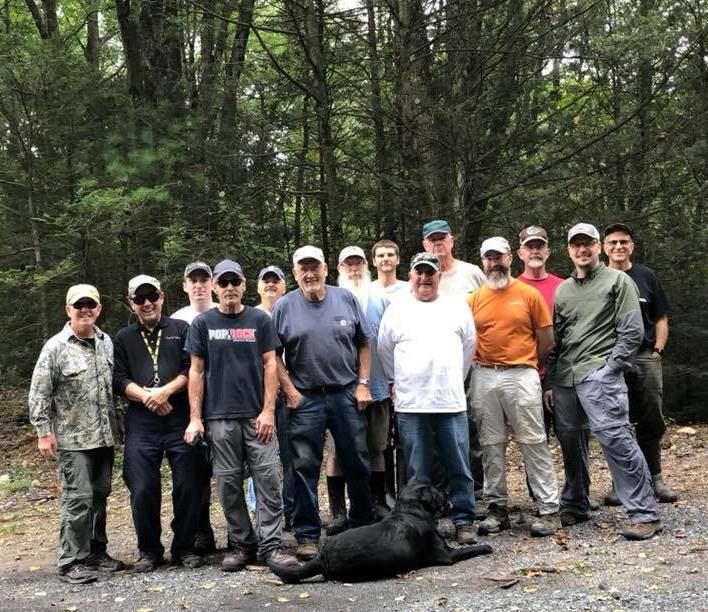 Twenty veterans from the Harrisburg and York Veterans Centers participated in the chapter’s 10th Annual Home Waters event, once again hosted by Ed & Nichole O’Gorman on their beautiful Clarks Creek property. Each vet was assigned a chapter volunteer to guide them on the stream following the introduction activities hosted by RoseAnn Viozzi and a sumptuous buffet luncheon served courtesy of the local Applebee’s franchise. The stream had been stocked several days before the event by chapter volunteers, and there were plenty of nice rainbows caught by both fly fishers and spin fishers alike. All of the vets we heard from expressed their heartfelt thanks for their day spent as guests of the chapter. We couldn’t have done it without the commitment of RoseAnn Viozzi and our chapter volunteers to make this another memorable Home Waters event! Click here to see some pics of the event. The Dr. Francis J. Viozzi Memorial Educational Scholarship for Environmental Studies was presented to a young lady, graduating from Hershey High School. She is an exemplary student with a 98.7 GPA. She has been very active in the community as a volunteer, including participation in The Walk for Clean Water. She plans to attend Susquehanna University and major in Earth and Environmental Science. This scholarship, administered by The Foundation For Enhancing Communities (TFEC), is awarded annually to remember and honor the late Dr. Frank Viozzi’s many years of outstanding service to Doc Fritchey TU. 6 DFTU volunteers assisted PA Fish & Boat Commission personnel in the float stocking of the Quittapahilla Creek DHALO waters in the Quittie Nature Park in Annville. This section of the Quittie was added this year to the PFBC’s Keystone Select Stocked Trout Waters program, and as a result this stocking included an estimated 200 trout, mainly rainbows that were 14” or larger in size, with many exceeding 20.” To see a few pics of the day’s activities, click here. 125 chapter members and guests attended this year’s Conservation Fundraising Banquet on March 24 to help celebrate the 48th anniversary of the founding of our chapter. As a special treat this year, widely known fly fishing expert Joe Humphreys was on hand to autograph his book Trout Tactics and share some of his anecdotes during his early years at Penn State working with fly fishing legend George Harvey. As always, there were plenty of unique live and silent auction items on hand to keep the crowd involved in the bidding process, as well as kayak, card and bucket raffles to round out the evening’s fundraising activities. We thank all those who attended and made this year’s banquet another rousing success! To see a few pics of the event, click here. The 2018 Rivers Conservation & Fly Fishing Youth Camp is seeking candidates, ages 14 to 17, to attend this year’s camp to be held at Messiah College from June 17-22. Each year, our chapter budgets funds to sponsor 3 students at a cost of $550 per student. Further details are available in the Press Release. If you are aware of any students in Dauphin or Lebanon County who might be interested in attending, please direct them to our website. Each year at our banquet, some worthy DFTU member is chosen to receive the Gerald R. Miller Outstanding Volunteer Award in honor of his or her contributions to the chapter’s conservation mission in Dauphin and Lebanon counties. This award honors the outstanding volunteer efforts of the late Gerry Miller, and is determined based on the submissions received on the nomination form. Please be sure to submit your nomination to Rick LaTournous no later than February 27 to be counted.